A periodic table showing the elements that exist as homonuclear diatomic molecules under typical laboratory conditions. Some examples include, gases carbon monoxide (CO), nitric oxide (NO), and hydrogen chloride (HCl). , etc. (but this convention is not always followed, and sometimes lower case letters and alphabetically out-of-sequence letters are used, as in the example given below). The excitation energy must be greater than or equal to the energy of the electronic state in order for the excitation to occur. give additional quantum mechanical details about the electronic state.
. Bands are spread out even further by the limited spectral resolution of the spectrometer that is used to measure the spectrum. The spectral resolution depends on the instrument's point spread function. The molecular term symbol is a shorthand expression of the angular momenta that characterize the electronic quantum states of a diatomic molecule, which are also eigenstates of the electronic molecular Hamiltonian. It is also convenient, and common, to represent a diatomic molecule as two point masses connected by a massless spring. The energies involved in the various motions of the molecule can then be broken down into three categories: the translational, rotational, and vibrational energies. ^ Hammond, C.R. (2012). "Section 4: Properties of the Elements and Inorganic Compounds". Handbook of Chemistry and Physics (PDF). ^ Whitten, Kenneth W.; Davis, Raymond E.; Peck, M. Larry; Stanley, George G. (2010). Chemistry (9th ed.). Brooks/Cole, Cengage Learning. pp. 337–338. ^ Sherman, Alan (1992). Chemistry and Our Changing World. Prentice Hall. p. 82. ISBN 9780131315419. ^ Huber, K. P.; Herzberg, G. (1979). Molecular Spectra and Molecular Structure IV. 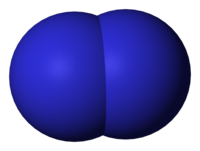 Constants of Diatomic Molecules. New York: Van Nostrand: Reinhold. ^ Langford, Cooper Harold; Beebe, Ralph Alonzo (1 January 1995). The Development of Chemical Principles. Courier Corporation. ISBN 9780486683591. ^ Ihde, Aaron J. (1961). "The Karlsruhe Congress: A centennial retrospective". Journal of Chemical Education. 38 (2): 83–86. Bibcode:1961JChEd..38...83I. doi:10.1021/ed038p83. Retrieved 24 August 2007. ^ a b Gilmore, Forrest R.; Laher, Russ R.; Espy, Patrick J. (1992). "Franck-Condon Factors, r-Centroids, Electronic Transition Moments, and Einstein Coefficients for Many Nitrogen and Oxygen Band Systems". Journal of Physical and Chemical Reference Data. 21 (5): 1005–1107. Bibcode:1992JPCRD..21.1005G. doi:10.1063/1.555910. ^ Laher, Russ R.; Gilmore, Forrest R. (1991). "Improved Fits for the Vibrational and Rotational Constants of Many States of Nitrogen and Oxygen". Journal of Physical and Chemical Reference Data. 20 (4): 685–712. Bibcode:1991JPCRD..20..685L. doi:10.1063/1.555892.